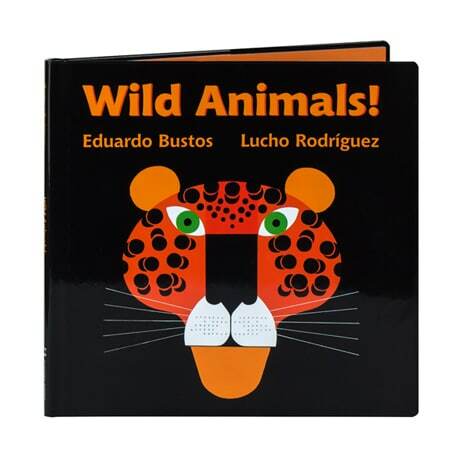 Artfully presenting some of the world's most intriguing wild animals—who introduce themselves with brief greetings to the reader—this book features the bold graphic interpretations of designer Lucho Rodríguez, portraying each creature in full and with a large facial portrait. The bright geometrical designs, set against a glossy black page, remind us a bit of Charley Harper's stylized wildlife, as Rodríguez depicts the leopard, hippo, lion, hyena, fox, yak, sloth, and the koala, as well as the fennec fox, spotted owl, and the spectacled bear. Intended for youngsters up to 6, the book may fascinate fans of modern art and design as well.